In this second and final post in a series, I’m responding to Bill’s reservation about robot cars. In my first post, I responded to Bill’s objections to robot cars. Now I want to draw attention to some benefits I think he (and others) overlook. So here, in no particular order, is a list of some of the potential benefits of robot cars. Less parking. There may be three nonresidential parking spaces for every car in the United States. Imagine if we could reduce that to two or even zero. A car that can drop you off wherever you want and then leave doesn’t need parking space. How much land in our urban centers could be turned over to productive use (some say one-third of downtown Minneapolis is surface parking)? How much more livable could we make these places? How much stormwater runoff could we prevent? If cars needed to park at night or during off-peak times, they could drive to places no one likes for storage, or simply double or triple-park on wide roads. 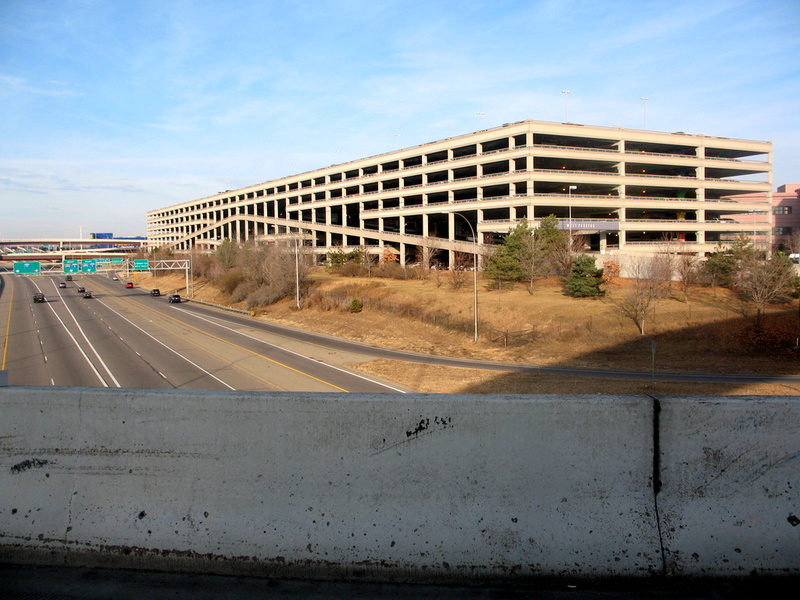 As Matt Yglesias points out, giant mall parking lots and park-and-rides would become an artifact of history. The right vehicle for the right job. As Americans, we know that we might at a moments notice need our vehicle to traverse craggy cliffs and deeply rutted canyons to engage in some unique adventure in unspoiled wilderness. This desire (as well as comparatively low, low gas prices) means we often drive vehicles that are much too large. Imagine a world in which you could summon that hulking four-wheel-drive beast when you needed it to move those steel tubes around the construction site, but for your daily commute you could summon a half-width hybrid electric podcar. This would mean significant fuel savings and more efficient use of our existing roads. Safety. Yes, there will still be accidents, but far fewer per mile. At least there should be, or we shouldn’t even consider adopting robot cars. And the current track record (although slim) looks good. Computers never get tired, drunk, don’t talk on the phone or text, don’t speed and won’t drive beyond the limits of the vehicle or the weather. Cyclists and pedestrians should rejoice. Obviously road design issues are still very important, and the coming of the robot car does not mean we should stop thinking about how all modes will interact. Current bus systems are designed to economize on one of their most expensive components: the human driver. Contemporary buses are enormous and run infrequently. At off-peak times, they’re almost empty. Buses that drive themselves will be dramatically cheaper to operate, which means that we’ll be able to afford many more of them. Instead of a full-size bus stopping every 15 minutes, it’ll be feasible to have a van stop every 3 minutes. And because each mini-bus will pick up fewer passengers, travel time will be lower. Indeed, it’s not clear that the concept of a “bus” will even make sense in a self-driving world. More likely, when you order a self-driving taxi with your smartphone, you’ll be offered several options. You might be offered a private taxi for $3, a taxi shared with one other person for $2, or a carpool van with several other people for $1. The dispatching software will be able to automatically group together passengers taking similar trips at the same time, so the carpool options shouldn’t add much time to the trip. With those low-cost options available, it’s not clear anyone would want to ride a bus. Think about this future: transit becomes cheaper as a system, people have more options and arrive more quickly at their destination, and political wars over transportation funding cool as the line between “transit” and “car” star to blur. Yes, we still need to care about sprawl, and yes we still need to care about equity. But those are issues we’ll have to deal with no matter what our transportation systems looks like. These are policy issues, not technology issues. Robot cars may be able to drive us around, but they won’t vote and they won’t be making laws. We can harness the benefits of robot cars to create more livable and environmental sustainable cities. I'm inclined to agree with much of what you've written here, however, I think you may be overlooking an equally plausible outcome. While robocars might convince some people to ditch their private cars and live closer together near transit hubs, plenty of others will discover that a 3-hour commute isn't so bad after all, since they can sleep, play angry birds, watch tv, work on their laptops, or read a book the entire time. The increased mobility and efficiency that freeways brought to the transportation system resulted in reduced density, why should we believe that efficiency created by robot cars would have a different outcome? Robot cars or not, I don't think 3-hour commutes will be very attractive to many people. And if information technology advances to the point where you can work for six hours in your car instead of your office, why wouldn't people just work from home? As for cost, I don't think this technology will dramatically impact the cost of driving much, especially if you live in a far-flung location. Driving 40 miles each way will still have large energy costs, whether you use a robot car or a self-driven car. Uncongested freeways at the fringes also won't benefit much from automated car operation. All that being said, as I say in the post, there is still a role for strong land use planning and regulation to protect the environment and use resources wisely. @ Reuben … I would expect a "3 hour commute" [Well a 1 to 2 hour commute, since 3 hours is more remote than we need to be, and robot cars will be faster] to be common, but only 1 or 2 days a week. Since we are in the future, most things can be done remotely, and going into "the office" will become rarer and rarer. Some things will still need to be done in person (I guess, like raising children, though I really like the education pods of the last Star Trek film), but robots can replace lots of things, and people may live at their "cabins" 5 days a week and have a hotel or flat in the city for 2 days a week. @Brendon … I think eventually we will give sentient beings (e.g. androids like Data) the vote, but probably well after the advent of robot cars. You make good points of course, but your 2-part series (response to Bill's criticisms and and potential benefits) make robot cars sound like a panacea. I'm highly skeptical that any technology is a panacea without costs. The only drawbacks you reference (sprawl and equity, at the very end) are, as you write, common to all modes (except, perhaps, walking). So what ate the mode-specific drawbacks of robot cars?